Where to Find the Best Gudeg in Bandung. Like, the BEST. Disclaimer: My ‘best’ might be different from your ‘best’. But if you’re curious with mine, read on. Having lived in Bandung for 4 years during college, I never really looked up for Gudeg. True story. Because it’s not really the staple food for Sundanese, in here we would prefer Chicken Noodles (Yamin) or Siomay or Batagor instead. But when that substantial craving kicked in, usually I’d go to popular Gudeg places in Jalan Riau (R.E. Martadinata). Back then, even street-food Gudeg vendors would already satisfy me enough because I don’t really complain whether my Gudeg meal was overly sweet or savory (which is rare to see in here), I don’t really care. BUT THAT WAS UNTIL I FOUND OUT ABOUT THIS PLACE. Now, 4 years later after leaving Bandung, making friends with several (very) trusted culinary experts and true foodies which are mostly incused from Jalan Sutra (one of the most historical culinary enthusiast community in Indonesia), most of them recommend this particular Gudeg place. To me, Gudeg Yu Nap has the closest authenticity to Jogja’s savory style of Gudeg. Moreover, when I went to the World Street Food Congress (WSFC), I met the owner Jeffry Sie whose apparently became Indonesian contingent for the Kue Pancong & Pukis stall. Almost dying out of curiosity, I decided to make a one-day short trip to Bandung just right after I went to Keuken on 9 June and had 11-course 'snacks'. There goes my record of the shortest time I’ve been in Bandung –6 hours top! “Gudeg, to the lesser foodies, is a complex thick young jackfruit stew-reduction that comes in a rice meal set with stewed or fried chicken and greens. The lightly sweet, salty and savoury stew is so gratifying, even if you’ve had it for the first time.” – KF Seetoh. Makansutra’s very own KF Seetoh, praised this little gem as a very satisfying dish, a dish that even he could still remembered the taste & sensation as he wrote it in his article. Believe me, when the man says so, believe everything he says. The President appointed him as the Food Ambassador of Singapore for a reason! 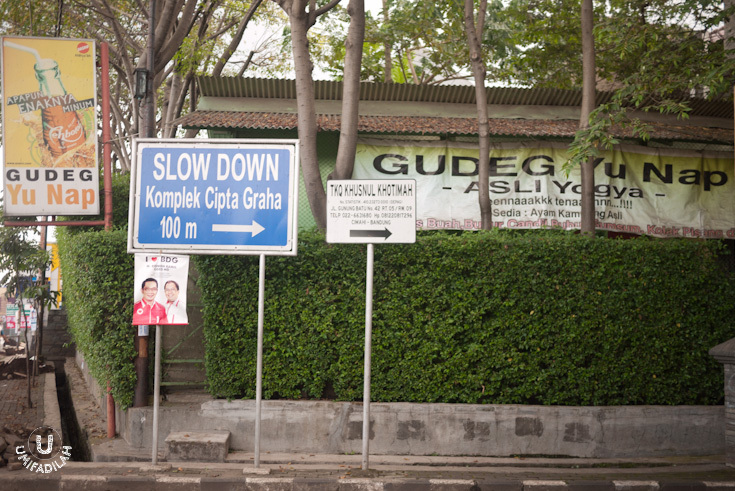 Tip: You can also look for ‘Komplek Cipta Graha’ on the map or by asking the locals. 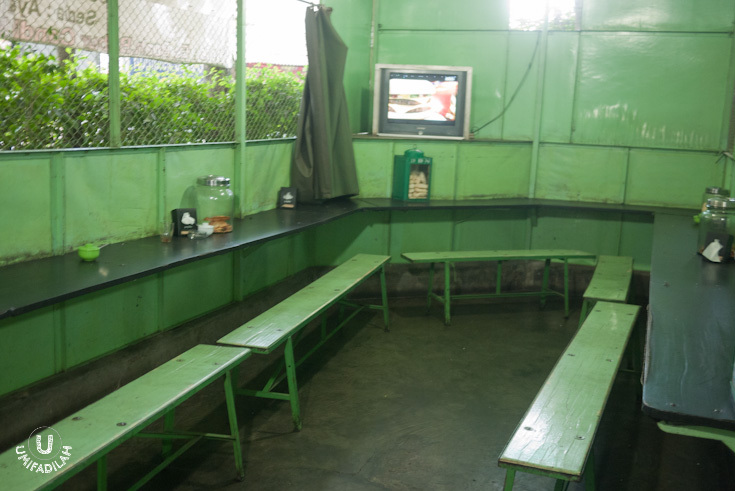 The interior in Gudeg Yu Nap is pretty much simple. 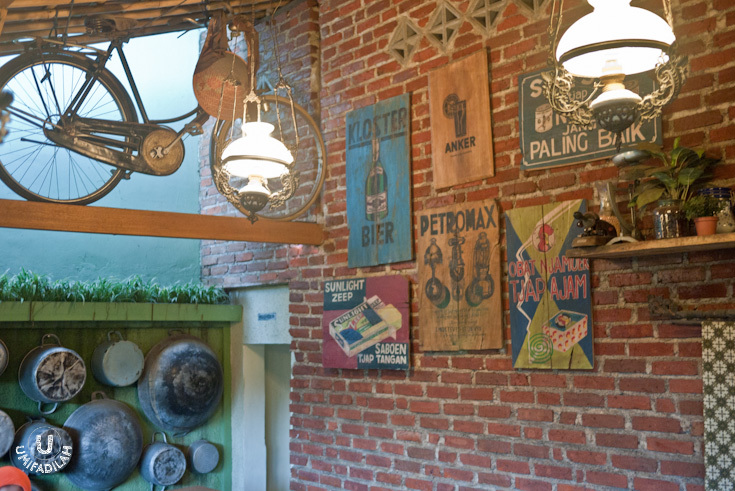 It has two different areas; on the front which looks almost like your local ‘warung tegal’ seatings with green nuance & quick-meal concept, and the inside dining area which is more suitable for family and has a more laid-back ambiance with traditional Dutch-Indonesian decors. Everything was served buffet-style. As we began to enter the restaurant we saw plenty of cooking pots & crocks. You need to place your order first before being seated. Turns out that Gudeg Yu Nap also serves dishes other than Gudeg, such as Telur Pindang (stewed egg), Gulai Opor Ayam (chicken stewed in coconut milk & herbs broth), Buntil Daun Singkong/Pepaya (spicy wrapped cassava/papaya leaves), Pisang Goreng Madu (honey-coated banana fritters) and more. Although we had quite a blast at Keuken, it’s hard to restrain ourselves from ordering these additional non-Gudeg dishes not only because it was mouthwatering, but also very unique in a way that you wouldn’t ever imagined finding Mangut Ikan Pari or Brongkos Daging Sapi in a Gudeg restaurant! Full Gudeg meal set (Gudeg Komplit). Contains the Gudeg or jackfruit stew itself, with all the standard sidekicks: spicy braised beef-skin (sambal goreng krecek), stewed free-range chicken & tofu in turmeric coconut milk broth (ayam & tahu opor), brown-stewed egg (telur pindang), and the boiled cassava leaves. Does it make you drool already? What I really love about Yu Nap’s Gudeg is the fact that, indeed, they added boiled cassava leaves as influenced by Jogja’s savory style gudeg (although in Jogja they don’t boil it separately; some of them blanched the cassava leaves along with the jackfruit stew itself – making it tastier). And every little sidekicks – the spicy braised beef skin, stewed egg, and chicken & tofu opor – just complement each other. They are the necessary elements in every Gudeg meal, not even trying to outshine each other. In fact, you have to make sure that there’s a little chunk of each in every bite to accompany with a spoonful of fragrant steamed rice. Wow. Tasty. Super tasty! Mangut Ikan Pari. Javanese-style Smoked Stingray in Spiced Coconut Milk. Honestly, it’s kinda rare to see stingray being served in restaurant. Moreover in here, traditional local restaurant – as I mostly found these on an upscale western restaurant; cooked with some simple recipe but comes with a fancy price tag. That's what made me super excited at the first glance. 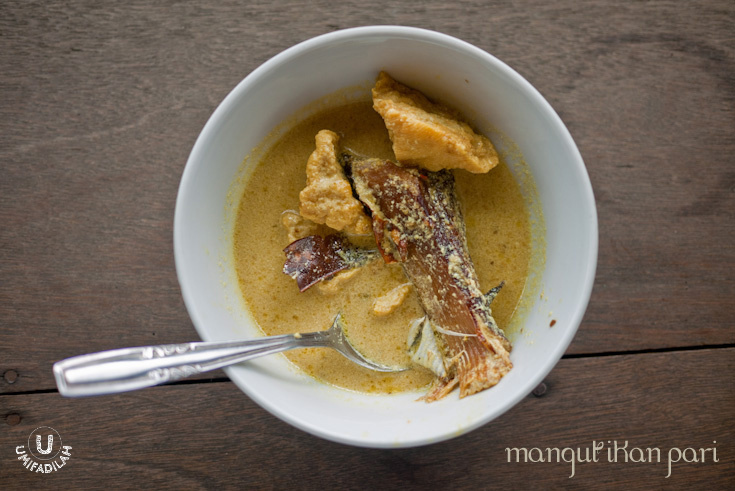 Mangut has a strong Javanese influence, it's basically spicy coconut milk broth with the usual addition of smoked fish in it. I remember I used to eat a lot of Gurame Mangut in Jogja. At my first bite, OMG, it tasted really really good I almost ate it with tears. It’s a burst of smokiness flavor from the stingray itself, and the blend of all herbs & spices into light coconut milk in this dish creates a perfect harmony that when you spoon the broth with a dollop of rice, it’s just pure… awesome. I’m running out of words to explain how good this was, but if you ever made a trip down here to Gudeg Yu Nap, this is definitely NOT TO BE MISSED. Brongkos Daging, one of so many highlighted dish in Gudeg Yu Nap. This is traditional Javanese beef stewed in coconut milk and kluwak/black nuts. Unlike Rawon, this one's slightly sweeter. Truly recommended! 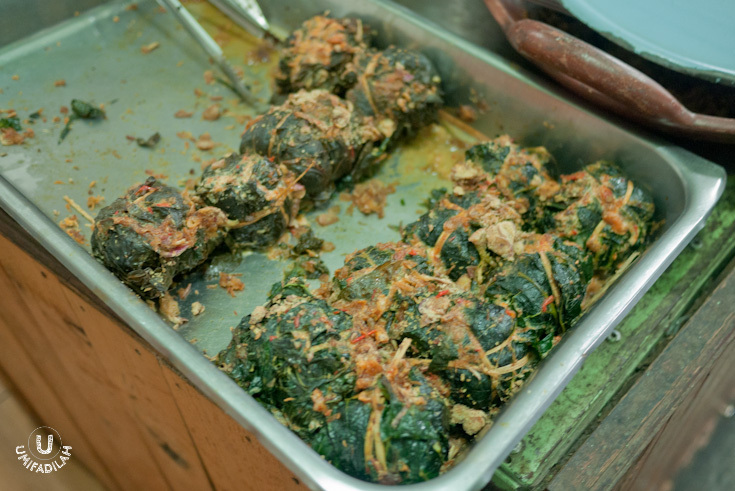 Spicy wrapped cassava/papaya leaves, after being cut and drenched with spicy coconut milk. TASTED AWESOME, BTW. 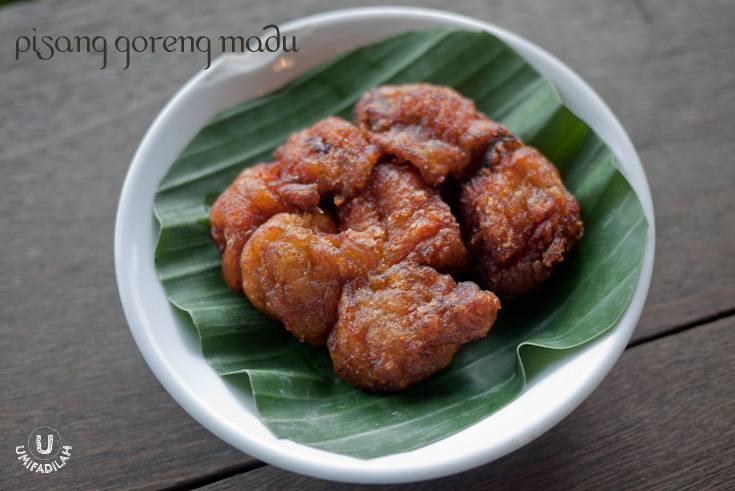 Pisang Goreng Madu. Honey-coated banana fritters. Translated as Honey-coated Banana Fritters, this little gem acts as a perfect snack in between your waiting period for the main-course to come. At IDR 3.500 each, there’s just something about this particular banana fritter that is strangely addictive. It’s so good and it’s hard to stop munching them even though you said you’re full already. I have no idea what type of banana they are using, but it’s probably ‘Pisang Tanduk’. A perfect afternoon snack! 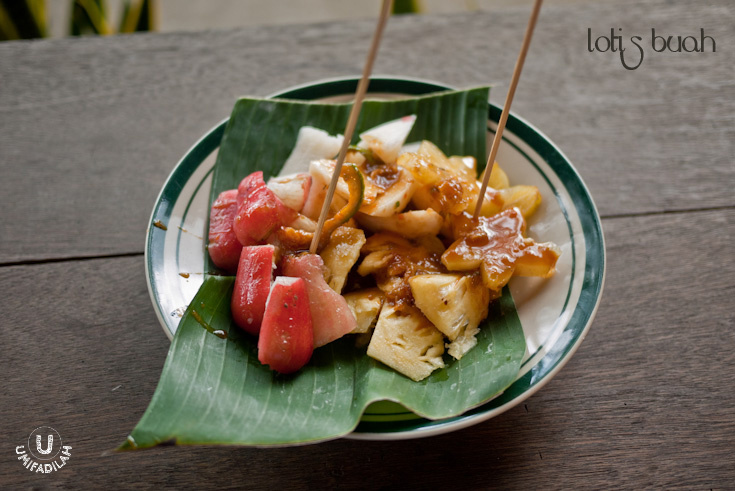 Similar to Fruit Rojak, except that they use a tropical 'mangga kweni' in their rojak sauce, which elevates everything and gives flavor boost. Super refreshing! The only thing I regretted, too bad that we came there on half-full stomach, post being filled half way up in Keuken. Or else, we’d also be ordering their Brongkos Daging (beef stewed in coconut milk and kluwak/black nuts), Ikan Nila Bacem, and else. But curiosity led me to ordering those for take-away, lol. And their Brongkos Daging that looked almost the same as Surabaya’s Rawon was superb! Next time when you’re headed to Jakarta via Pasteur, make sideways trip to Gudeg Yu Nap and it might be the highlight of your Bandung getaway.